Today I had a very corvid filled day. This morning three crows flew by the front of the building I work in. The front of the building is mostly glass and they were very close, creating this streak of black whooshing by, accompanied by this chorus of loud hoarse cawing. It scared the heck out of someone walking into the building, which made me laugh. I felt the Morrigan’s presence the whole day, but she wasn’t quite done getting my attention. As I drove home I drove past the town park. Its just a little strip of green with a playground along Candlewood lake. I drive past it everyday. I might see the occasional crow there, or even a raven once in a while, but nothing like the gathering that greeted me as I drove by today. Every tree was filled with crows. Every single one. They were everywhere I looked, and the sound of them all calling out was all I could hear. I literally stopped the car and parked, and just watched them in awe. The sound of so many corvid voices, all calling out at once echoed through me. The dream came flooding back to me. 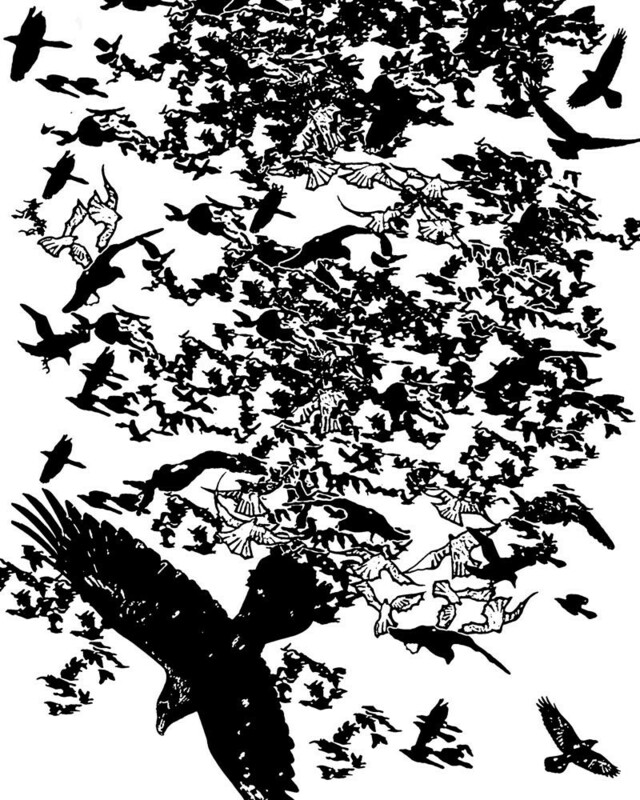 A gathering of crows, a flock, a herd, a mob, an army of the Morrigan’s children gathered together. I walked around the park for a little bit, sat on one of the benches by the lake and watched them. I quietly chanted “Morrigu, Morrigu, Morrigu…..” over and over to myself. It was a cold day, with some snow still on the ground, and there was no one in the park save myself and crows. I thought of all the people who had gathered together to honor Her at the PantheaCon ritual I had attended, I thought of other rituals where Her children have gathered together, I thought of all the sisters on Morrigu’s Daughters, I thought of all the people who have emailed me or talked with me about being drawn to her, I thought of how she is calling her children together. In my mind I tell Her “Tell me what to do, and I will do it.’’ The reply comes immediately. “Be a Power.” The same message I received from Dagda (see my previous post for more on this). The Morrigan is gathering her Tribe, She is calling to us more than ever before. She is calling her heroes, her champions. An army of ravens. There is work to be done. But what is the work? What is she rallying us to? I think in lettering her into our hearts, in letting her transform us, we in turn begin to transform the world around us. The world certainly needs it. And all who stands before the Morrigan leave transformed. It's so wonderful reading this and so very true. One thing that caught my eye was the line "...She kisses me on the brow and I wake up.” That is a recurring event with Her I have personally experienced as well. I have had the very same dream many times. This was how I knew she was calling me. Blessed Be the Great Queen. - Raven Morgaine, Priestess "Morrigu's Daughters"